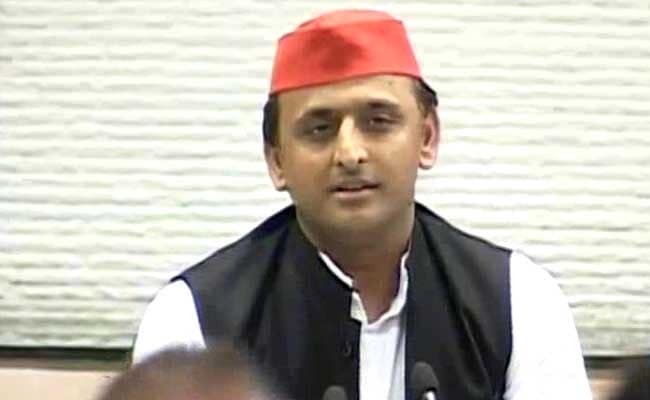 UP election results: Akhilesh Yadav put in his papers soon after accepting defeat at a press conference. Lucknow: Uttar Pradesh Chief Minister Akhilesh Yadav on Saturday tendered his resignation to Governor Ram Naik after his Samjawadi Party's massive defeat in Assembly polls. The Governor has accepted his resignation and has asked him to continue till further arrangements, a Raj Bhawan spokesman said. Soon after accepting defeat at a hurriedly convened press conference, Mr Yadav proceeded to Raj Bhawan to put in his papers. Earlier, while addressing media, he had stated that he will review the performance of his party booth-wise to find out the reasons of defeat and stressed that perhaps the people voted for more development. The BJP registered a massive victory in the state, winning over 320 of the state's 403 seats. This is the second biggest win for the BJP since winning the 2014 national election. "Thank you. Long live democracy," tweeted Prime Minister Narendra Modi in response to a tweet by Congress vice president Rahul Gandhi congratulating him and the BJP on today's wins. The BJP is also set to sweep neighbouring Uttarakhand. Punjab was the only consolation win for the Congress, which will come to power after 10 years in the state. Arvind Kejriwal's Aam Aadmi Party emerged as the day's big loser. The mega UP election, held in seven rounds, is seen as a bellwether for the 2019 national election. The win is seen as an endorsement of the PM's stewardship of the economy after his decision last November to scrap high value notes, aimed at eliminating corruption and black money.